The first weekend of May is kind of like a whole holiday season in France. Even though only the first day of the month is the official holiday (France’s Labor Day), a whole lot of people turn it into a vacation. To faire le pont means to make a bridge between a holiday and the weekend closest to it, to get a nice 4 or 5 day stretch of R&R using only a day or two of precious yearly vacation time. Shutters are slammed, houses sealed, cars loaded with equipment and children, and the autoroutes suddenly get clogged with cars. Predicted road conditions for the weekend all over the country are reported on the news and radio, alerts and traffic jam warnings are announced. We hit the road to visit family in Provence! Our first morning, we went to the market with Brigitte on Cours Lafayette in Toulon. 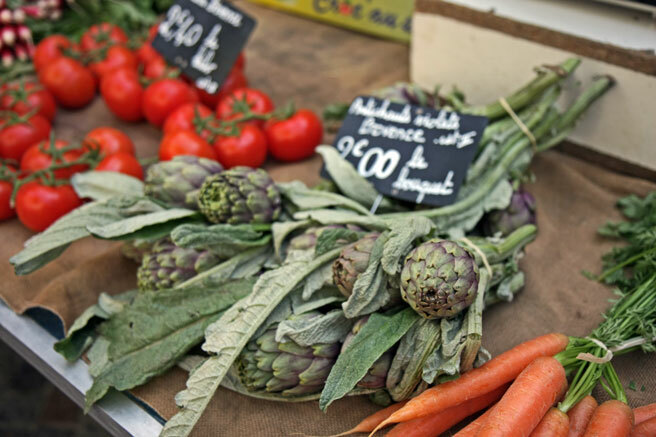 We saw lots of lovely thinks like artichokes, feves and other legumes, green beans, peas, and herbs ready to eat and coming from the neighboring towns. The great thing about spring in Provence is all those things we’ve been craving over the winter have burst forth like an explosion down here. Brigitte suggested Artichauts à la Barigoule, how can we resist? We got some artichokes grown on a farm in the town that has our favorite summer beach. Artichauts à la Barigoule is classic all through the restaurants of the Cote d’Azur. From Nice to Marseille, you’ll surely see it on café tables at this time of year. 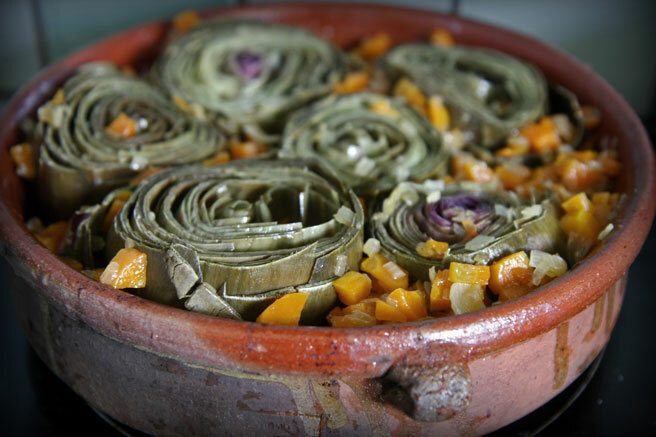 Simmered artichokes in the style of Provence. You can serve them simply without meat, enjoy them with a classic addition of bacon, or even better, stuff them for a delicious first course or supper. Pare the artichokes, tugging off any hard scaly leaves at the base, and clipping off the scaly points with thorns from the ends of the leaves with a pair of kitchen scissors. 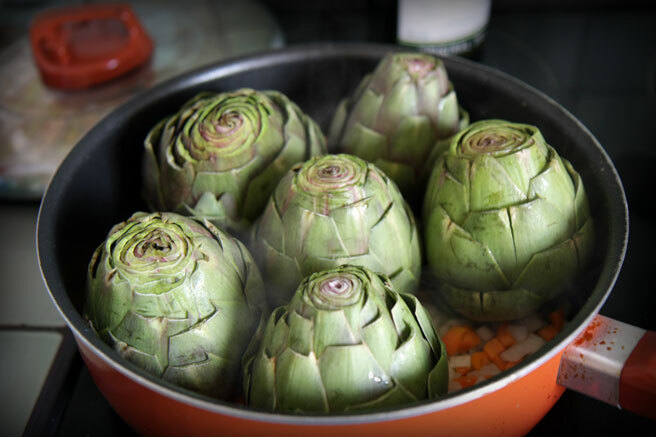 For the top end, use a knife to generously slice off the top, as far as halfway down, depending on the freshness and maturity of your artichokes. Do not be shy about cutting your artichokes. The edible part is inside, at the bottom. Mince the onions, dice the carrots and cut up your garlic. If you are using old garlic, mince it up small. If you are using fresh garlic, you can chop it up roughly into chunks, since it’s much milder in flavor. At this time of year, the big chunks of garlic look nice and taste wonderful. In a heavy bottomed skillet that has a cover, heat two tablespoons of olive oil and add the diced onion and carrots, spreading them across the bottom of the pot. 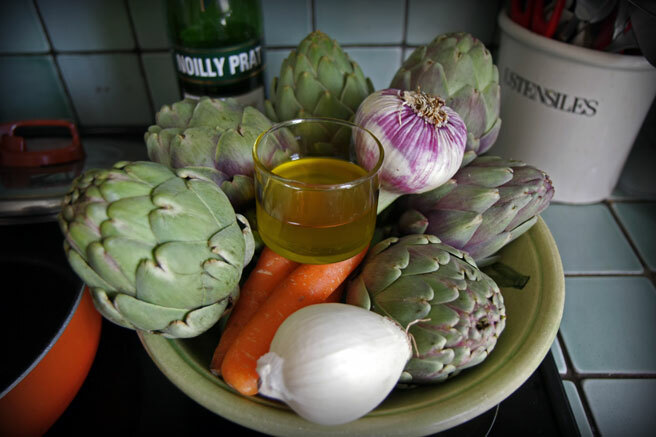 Place the artichokes over the bed of onions and carrots with the leaves facing up, season with salt and pepper, drizzle two more tablespoons of olive oil on top, cover the dish, and cook over medium heat for 10 to 15 minutes, shaking the pot from time to time. The artichokes, onion and the carrot will release some juice at first, so keep the cover on, because they will steam in these juices. After about 15 minutes like this, the onion and carrot will begin to caramelize underneath, turning brown. You’ll smell it, the smell of the steaming artichokes will mingle with the warm nutty perfume of caramelizing onion. Today, the Provencal sun streamed like hot liquid through the kitchen window, making me think of summer and the beaches, warm pebbles between our toes. My imagination got away with me and I mistook the sizzling noise coming from my artichauts à la barigoule for the buzz of summer chicadas. The cool spring chorus of singing birds in the garden was upstaged by the sizzling caramelizing onions, and I knew the time had come to throw a little wine on it. Add white wine all at once, and let it bubble without covering for another 5 minutes, allowing the liquid to reduce by half. Some people might add some minced bacon at this point, but that is optional. Sprinkle the garlic on top, drizzle with another 1/3 cup of water, lower the heat and simmer, covered, for another 15-20 minutes. 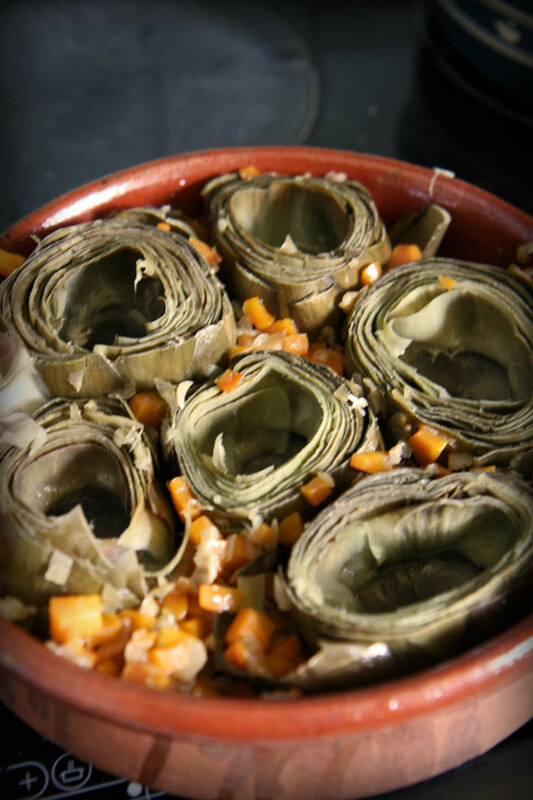 The artichokes can be served like this. Chilled or warm, simple Arichauts à la Barigoule. 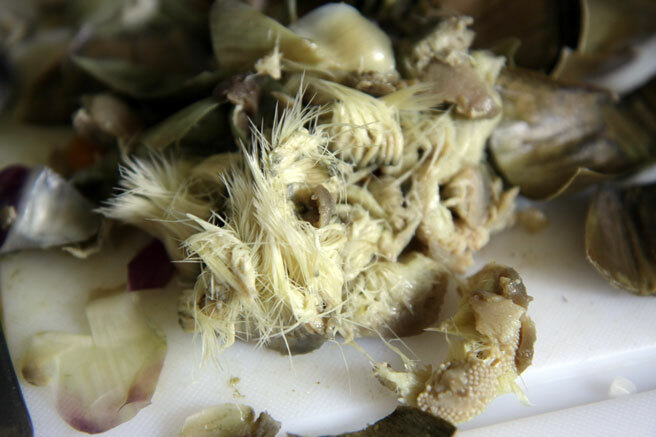 We take the whole artichoke, and eat the soft edible parts, the silky inner leaves, the heart. If you want to chill them, let them return to room temperature and move them to the refrigerator in their pot. Today, since we were going to have them for lunch and only had some beans to serve with them, Brigitte and I agreed that it would be nice to stuff them. What you stuff your artichauts à la barigoule with is really up to you. Traditionally it is done with a little bit of fresh pork belly, sautéed to cook through, seasoned with maybe some garlic and nutmeg, a little parsley and onion, with a panade of bread crusts soaked in cooking liquids worked into the lot. We had some plain sausage today, so I used it in the stuffing. That, with some sage from the garden, a crumbled handful of the herbes that Yves picked up from one of his walks in the garrigue, and I stopped there, feeling like it needed nothing more. While they are still warm and they are nestled into their dish, pinch out the very center bunch of leaves and carefully scrape out the cottony layer above the heart, leaving a nice little pouch for stuffing in the middle of each one. You can reserve the little bunch of soft leaves from above the cotton, and include them in the stuffing or use them to garnish a salad. Note, very small young fresh garden artichokes might not have developed the cottony part, all the better, but most of the ones you see at the market will have it. Stuff the artichokes with your meat mixture, and cover the dish with foil. Heat through in a moderate oven, removing the foil and putting them under the broiler to brown the tops just before serving. 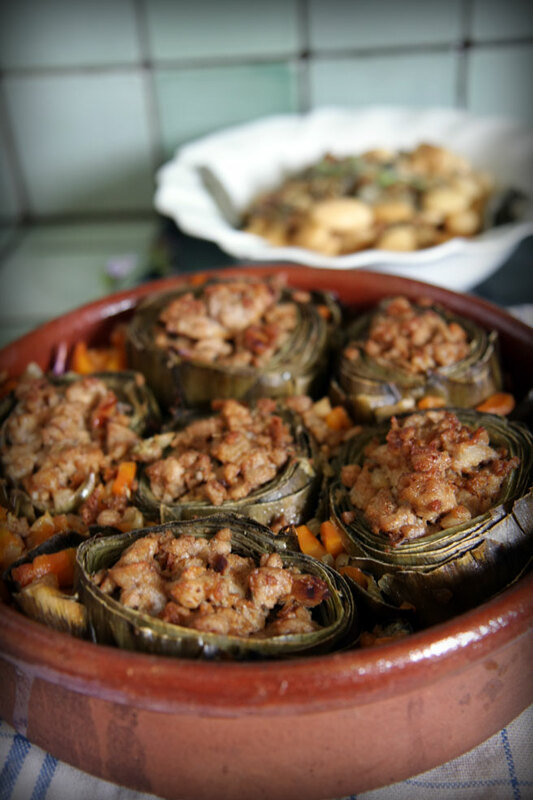 Stuffing the artichokes adds a whole new dimension to this recipe! This looks beautiful and simple, a great presentation for lunch with friends. Here, we have only the gargantuan variety that are as big as very large grapefruits! So one per person, stuffed, will make a hearty meal. les grecques fait le pont at every moment: last sunday we celebrated easter, the next day was easter monday, some people also celebrated easter tuesday, may day was on thursday, so of course on friday, ils fait le pont and voila le weekend! the French always seem to do everything quite better I love all your pictures of the artichokes. They're not common in Cuban or Latin food at all but I'm sure I could figure out some way to incorporate it. 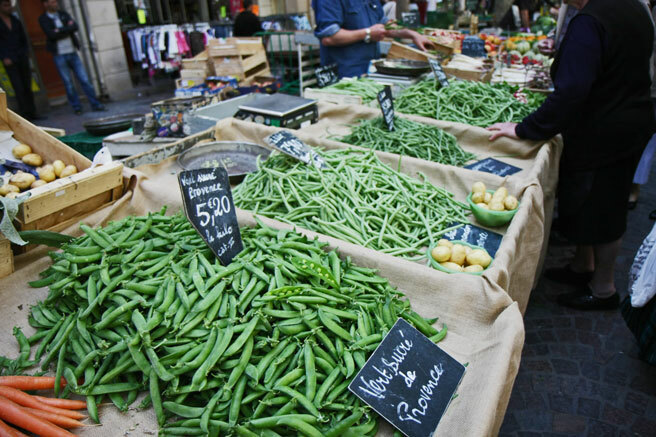 I've desperately been looking for my pics of a market I visited somewhere between Paris and Lyon...it was lovely. Gorgeous! I love the springtime markets. Everyone's so delighted to be out in the sun and the produce is so fresh and vibrant. And artichokes are just heaven. Elarael, thanks for coming by! This was served with some white beans and sage. It made a nice meal, although since there were four of us, we each had one and a half. Med Kiwi, The creativity that goes into these long weekends is endless. We basically eat what we can chew, meaning the tender parts of the leaves although the outer leaves don't have much to eat on them. Flam eats, I hope you find your pictures! 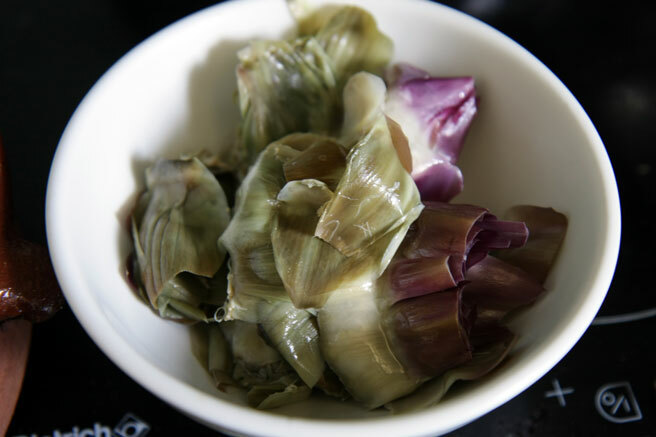 Artichoke hearts are also quite easy, and easy to eat for those not familar with the whole artichoke. 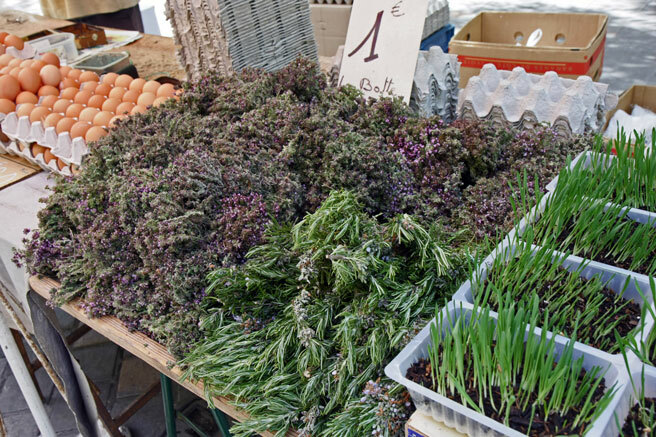 Kitt, the springtime market here in Provece is really something to see, that's for sure. I would love to cook artichokes, but here in South Africa it is a delicatessen and very expensive.Lovely photo's!!!! Just came in from the garden with six fat artichokes and wasn't sure what to do with them. Now I know! I've never made this recipe before. It looks amazing! Merci Lucy. Oh, I've always wanted to make this recipe! But it always sounded so complex and daunting. Thanks for making it seem a little more doable Lucy. thanks lucille for letting me know about what is tender - my mediterranean husband would not be amused if i kept insisting that my french friends eat the leaves too! It's nice to see you here Nina! Lou Lou, great to know I have provided you with some inspiration for the artichokes! 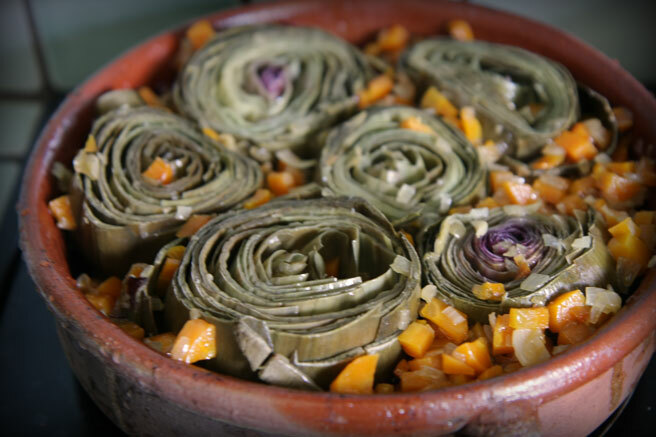 Ann, this recipe has always been one of my favorite ways to enjoy artichokes. I hope you do go ahead and try them. Med kiwi, the hard leaves get left on the plate! I adore artichokes, but always felt intimidated by hollowing them out to stuff them. This recipe makes me want to take the leap and try it! Simply beautiful, Lucy, with a delightful accompanying writing..and it clearly explains why I would love to pass on an award to you, which you can see on my latest post, hope you'll accept. I think I have only just barely tried artichokes. I think they were in a dip once at a restaurant and to be honest I don't recall anything much about them. They have always intrigued me though, with so many bits you do eat and so many you don't. I think I'll have to look for some to try them because I don't want to miss out! Your pictures make me so happy; they're fantastic.